It’s increasingly common to hear the steady hum of a drone flying on a construction site. They’re being used to share progress updates, manage earthworks, perform cut-and-fills and much more. But there’s also an emerging use case for drones within the civil engineering space: as designers move from 2D toward 3D design and BIM workflows, the reality-capture data that drones provide are making a huge impact on their projects. In short, drones are the latest tool in the civil engineer’s workflow, and they’re changing the way the world gets built. To show how, 3DR, a drone technology firm focused on the AEC industry, embarked on a project with Autodesk to explore the impact drones are having on infrastructure projects. 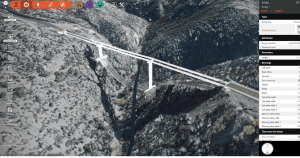 3DR aimed to show the complete drone-to-design workflow on a real-life project: the Pinto Creek bridge, an aging structure east of Phoenix that the Arizona Department of Transportation is demolishing and replacing. Drone data are particularly useful for a site such as Pinto Creek: it’s a large, steep ravine that a drone can quickly survey—going out in the field to collect this data would be time-consuming and, at times, unsafe. Also, flying a drone doesn’t require closing the road for manual inspection, which is particularly useful because there are no easy detours around the bridge. 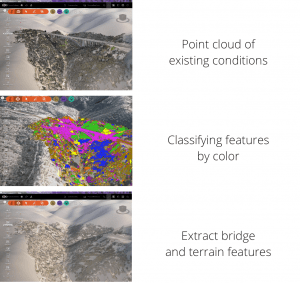 Images show a point cloud of existing conditions (top), features classified by color (middle) with the bridge in purple, and bridge and terrain features extracted from the image (bottom). Jeremiah Johnson, a member of the 3DR team, flew its Site Scan drone at Pinto Creek and captured the entire area in a single half-hour flight, collecting 358 high-resolution photos. After processing the images into a number of different data products, 3DR delivered a detailed point cloud to the Autodesk team for processing. Ramesh Sridharan, a product manager at Autodesk, imported raw point-cloud data into InfraWorks and processed them to extract and classify terrain features. As the area’s only structure, it was easy to classify the bridge (shown in purple in the accompanying figure) and remove it. 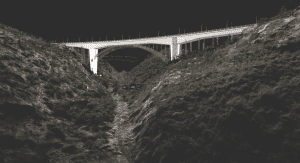 In a matter of hours, the point cloud was filtered, and a complete model was set up—aggregating point clouds, elevation data and existing infrastructure—that provided a rich context in which to design the bridge. 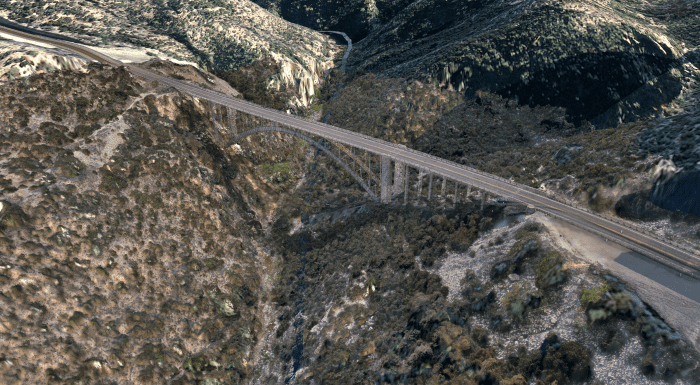 After the point cloud was prepared for design, Ara Ashikian Sr., a product line manager at Autodesk, created several bridge models with Infraworks in a matter of hours. He customized road alignments and grading, and could easily modify the parameters of each component that made up the bridge. The “magic” is behind the scenes: each component is fully parametric and dynamic, so designers can make changes while maintaining engineering principles. Parametric components of the new bridge were modified in InfraWorks. 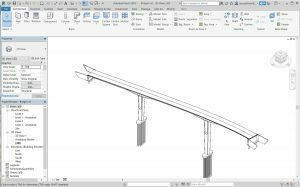 A bridge model can quickly and easily be sent to Revit for detailed design. In just two clicks, Ashikian sent the final bridge into Autodesk Revit to perform more-detailed design. Because the structure’s underlying components were based on parametric geometry, they could easily be exported into Revit and other tools without needing to recreate them or perform any re-work. Images show a bridge design based on a conceptual view of satellite data (left) vs. a design based on point clouds from drone data (right). Civil engineers too often work with outdated surfaces when starting the design process—it can be difficult to access a reliable point cloud, so they fall back on old survey data, satellite images or blueprints as a replacement. Using drones, designers now can quickly and easily collect up-to-date data on existing site conditions and design with confidence. By putting drone data into tools such as InfraWorks, civil engineers can rapidly design in 3D and then share models with clients and other stakeholders far earlier in the project. This makes it easier to modify and iterate on the design before committing to a single solution. “If you can quickly and easily get a 3D version in front of a client, it avoids a lot of changes later on,” says Chris Harman, a civil engineer at Atkins Engineering. Drones also provide value long after the initial design phases: they enable constructors to digitize a job site as it evolves and compare as-builts to the original BIM or CAD models. This makes it easy to identify any issues before the fix becomes costly or time-consuming. Whether looking to get feedback earlier in the infrastructure design process, create more-accurate 3D concepts or re-digitize a job site during construction, drones and related software are proving to be crucial for engineering firms across the country. Hugh McFall is a writer at 3DR, covering the ways drones and robotics are transforming the construction industry; email: hugh.mcfall@3drobotics.com.